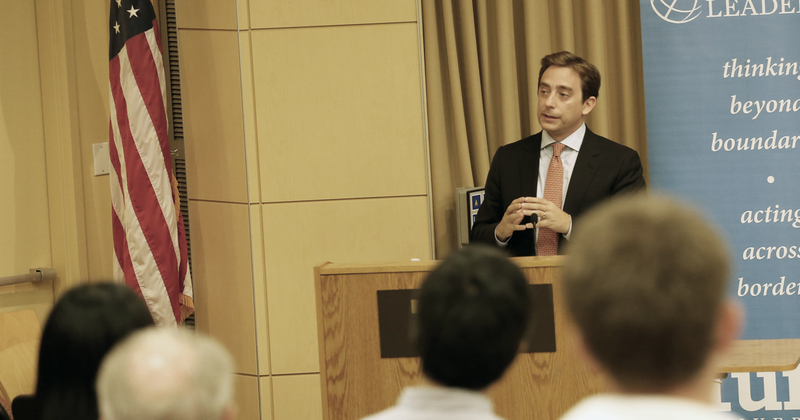 On November 13, New Yorker Reporter Evan Osnos delivered a public lecture at Tufts on “The U.S. and North Korea: A View from the Ground Up”, based on his recent visit to the country and his long-term reporting on the region. Watch a short interview conducted by Noah Rose. Osnos joined The New Yorker as a staff writer in 2008 and covers politics and foreign affairs. His book, Age of Ambition: Chasing Fortune, Truth, and Faith in the New China, based on eight years of living in Beijing, won the 2014 the National Book Award in nonfiction and was a finalist for the 2015 Pulitzer Prize in general nonfiction. He has also written from East Asia; his article “The Fallout” won a 2012 Overseas Press Club Award. Previously, he worked as Beijing bureau chief for the Chicago Tribune, where he was part of a team that won the 2008 Pulitzer Prize for investigative reporting. Before his assignment to China, he worked in the Middle East, reporting mostly from Iraq. The theme guiding his talk was “perception”, which he sees as the heart of the crisis, and the dangerous gaps in understanding between the U.S. and North Korea which could lead to real catastrophe due to perceptions of credibility and intentions. He quoted the scholar and game-theorist Thomas Schelling as saying, “Brinkmanship is the art of manipulating the shared risk of war.” While Osnos noted that this could be applied to past challenges that the U.S. has faced, including the Cold War and the Cuban Missile Crisis, the challenge with North Korea is that the world knows much, much less about North Korea. Osnos used a metaphor to illustrate how he understands the current situation: he likened it to two mountain climbers tethered to each other who are arguing on the side of the cliff. If either was suicidal, then they would have already jumped. The relationship is about survival yet, however rational each one may be, they may compete to seem the most irrational, edging constantly closer to the edge of the cliff and increasing the likelihood of going over. Osnos cited three major questions to consider: 1) How does North Korea perceive this crisis? 2) What’s important to understand about Kim Jong-Un? And 3) How does the US understand its own options? On the first question, he referenced his minder while he was in North Korea, who was a foreign policy analyst focused on the U.S., and specifically tasked with analyzing President Trump’s Twitter feed. Osnos said they are trying to make sense of this bewildering political moment, and they are asking three questions: Is the American public ready for war? Does the U.S. Congress want a war? Does the U.S. military want a war? What Osnos noted was that there was a subtle error in the analyst’s thinking: while the US is a divided country and does not want war, public sentiment in the U.S. does not necessarily translate into national security policy. That is a key gap in perception and how North Korea understands U.S. policymaking. He said the North Koreans have accepted that they may have to go to war and that their perspective is about survival: they had been through terrible devastation twice before (the Korean War and the famine of the 1990s), and if they have to go through it again, they will survive. Maybe not many of them, but enough and North Korea would go on. Regarding the second question, Osnos warned against underestimating Kim Jong-Un, noting that he has proved to be more brutal and more capable of navigating internal politics than people initially thought. He said that people focused on North Korean analysis do not think he is crazy, despite how the external public might view his actions. Osnos said that Kim Jong-Un sees what happened to the leaders of Libya and Iraq when they willingly gave up their nuclear weapons, and he does not want to make a similar mistake. Osnos said that Kim has gone out of his way to avoid being under Chinese control. He has not met with any of China’s leaders, and he has never received the Chinese ambassador. The founder of modern China, Mao Tse-tung, once described the relationship between the two countries “as close as lips to teeth”. But North Korea’s current leadership likens the relationship as China treating North Korea like “the dirt between their toes”, willing to sacrifice North Korean interests as needed. Osnos said that Kim does want economic development. North Korea is a very poor country, with a per capita income estimated to be the level of Haiti. Osnos described that for the elites, there is a race to get rich and to gain status. (A current mark of status is if a family owns a Yamaha piano.) What Kim will need to balance is raising an expectation of economic development raises the risk of discontent. As for the third question and understanding U.S. options, Osnos sees preventive war as the riskiest option. He said that the current administration is threatening a profound break with U.S. policy of the past 25 years. He explained that the impact of a preventive war would be catastrophic, with estimates of 60,000 people dying on day one and tens of thousands more in the following days. He thought a more plausible option is strategic strangulation – a combination of sanctions, information dissemination, covert action, bellicose language, etc. – that would signal to North Korea that they are on an untenable path. Another policy option is freeze for freeze, where the U.S. and South Korea agree to reduce military assets and exercises on the peninsula if North Korea freezes and/or reduces its nuclear program. He told the audience that North Korea is often referred to as the “Land of Lousy Options” by analysts and policymakers. Osnos believes that the U.S. has moved into the deterrence framework of the Cold War – Mutually Assured Destruction. He said North Korea is not Iran, it’s not an aspiring nuclear power, it is a nuclear and “we have to deal with the world the way it is, not the way we want it to be.” He continued that “deterrence is not game over”, but a newer, more complicated era of intelligence gathering. He explained that at its peak, the Soviet Union had about 5,500 nuclear warheads, North Korea has 50 or less. He thinks deterrence diplomacy can be effective.